Mindfulness is a meditation technique that focuses not on achieving a state of calm, but on observing thoughts and emotions as they are. The practice originates from Buddhism, but doesn’t require any spiritual inclination, and has been proven to have incredibly positive effects on mental health and wellbeing. 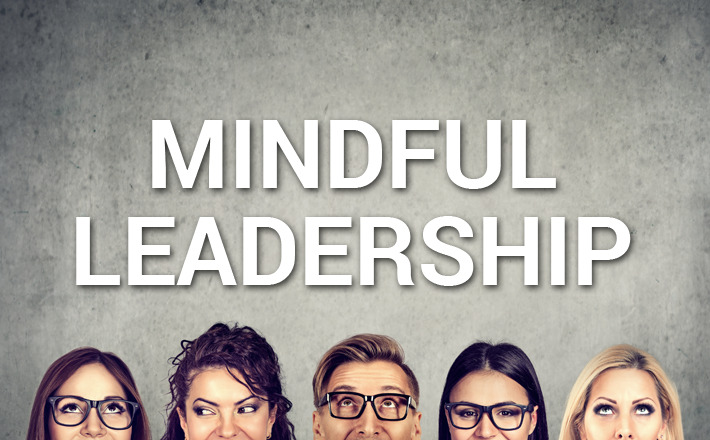 What we’re interested in exploring however, is how being mindful can improve our leadership skills. It makes sense, really. By now, you ought to be aware that strong leadership is heavily dependent on well-developed emotional intelligence. If you’re not, we recommending books or studies by author and scientific journalist, Daniel Goleman, who has written extensively on the subject. Ultimately, being able to understand how you relate to others, and how they relate to the world can only help your ability to lead them effectively. Before bringing your mindfulness to your team, work on yourself first. You can practise mindfulness anywhere, but ideally you’ll set aside some time for it, whether that’s when you first get up, or on your commute home. Get comfortable, relax your facial expressions and pay attention to your breathing patterns. Your thoughts will naturally come and go – it’s important not to fight them, but do take a mental note of them. It’s your choice whether you act on them later or not. This practice can elevate your mood, improve your concentration and boost productivity. Once you’re familiar with your mindfulness practice, you can begin to work it, and its benefits, into your working day. If you feel stress rising up that could be overwhelming, instead of pushing it down, take a moment to acknowledge it and decide whether the issue is within your control or not. If not, let it pass or put it aside for when you may be able to tackle it more effectively. Use this technique in how you relate to your team too. If you spot one of your colleagues getting increasingly stressed, take a moment to acknowledge their stress and see if anything can be done. Even if you can’t fix things, it can help people feel more appreciated and calm just to have someone recognise their feelings. Similarly, mindfulness can help you manage confrontation. Practice approaching conflict with the classic framework: “When you do X, it makes me feel Y. I would appreciate if you could Z instead, would that be ok?” and encourage others to do the same. When other people express displeasure with your actions, try not to react without thinking – take a moment to acknowledge and properly consider what they’ve said. Do note though, you will come across people who will refuse to reason with you, although not very often. In these situations, it’s not always healthy to invest too much time and energy in resolving conflicts. Instead, consider whether their attitude is having a detrimental impact on you and your work, or whether you can let things slide. If not, take the issue up with HR in line with company procedures. Because leadership is all about how we understand and motivate others, it helps to understand your own feelings and objectives before inspiring your team. People are far more likely to follow someone they feel has a good grasp of who they are. They’re even more likely to follow someone who can demonstrate self-awareness, remain calm under pressure and take people-focused approaches to solving problems. And, most importantly, you should always make your mental health a priority for your own wellbeing. For more information about mindfulness, check out the NHS website’s section on the practice and how it can help.